It has often been stated as being the greatest nation on earth by both Americans and foreigners alike. Every year there are not hundreds, not thousands, but hundreds of thousands of people that come to America both legally and illegally. This has been going on for a couple hundred years. Which just by itself says something. Parts of our history is ugly, yes. Parts of our present is ugly too. But a few things everyone needs to consider since America became, well...America. We have freedom of speech. This allows people to speak out publicly with out fear of persecution from their government. That's right. All those things you don't like, are offended by, disagree with, you can say so without fear of the government throwing you in jail, or worse. Some countries behead you. That doesn't mean your speaking out against what ever offends you gives you the right to take away some one else's rights. You just have the right to complain. We have freedom of religion. Which allows every one to practice what ever religion they want, or no religion at all. You don't like Christianity? That's fine! Great! Don't go to church, or buy crosses, or say the words "...under God" when reciting the pledge. That's your right. Practice what ever religion you want, or don't practice any. Don't take away someone else's ability to practice theirs. You do not have that right. We have a government system set up, while not perfect, it in theory has a checks and balance within it self. Further, it is ultimately purviewed by the very people it is governing, that means you and me. And we have always had the right to bear arms. Not for protection against robbery. Do Hitler and Stalin ring any bells? What about the British government the American Revolution fought to escape? THAT is our INALIENABLE right to bear arms. Untouchable. Undeniable. Can't be taken away. Not just shot guns, but all guns. Our forefathers were smart enough set in motion the legal necessities to protect us, US, the people. These are just some of the many reasons millions of people have come to America since the beginning of America. It's worked for over 200 years. Certainly not everything is perfect. And not all citizens like all these things, but they don't have to like them, just abide by them. Laws, from our ORIGINAL CONSTITUTION , were not made to be liked. It's called compromise for the sake of order and safety. These are the reasons America has been called such a great nation, a nation of opportunity. Our freedom and foundation is strong. Stop chipping away at it!!! Just because you are offended doesn't make it wrong! "Vow Vox Box"? Don't Panic! This was a smaller vox box but it was packed with some pretty great items from #SallyHansen, #Ecotools, #Puresilk, #Tide, and a coupon for a wedding website by #Riley&Grey. So let me give you guys the run down. The first item to try was of course Sally Hansen's the complete manicure nail polish in Barracuda Blue. What a fun summer name for a pretty light blue polish. Initially I tried it on both my fingers and toes. As I figured, I'm not a color on my fingernails kind of girl. I'm fairly boring in that department sticking with the tried and true french manicure. But oh my little toesies! They loved the blue, especially at the beach. As you can see above. It was just light enough to brighten up the toes, but not so dark to make people give your feet funny looks. Well more funny looks. Lets face it, feet can be kind of funny looking on their own. But my little toes felt so pretty in pink.... er blushing in blue with this color. It's a matte babyish sky blue. Very pretty and feminine. And definitely an option for the bride who might need that little "something in blue" on her special day. Try doing a french manicure with Barracuda Blue colored tips instead of the normal white. Elegant, colorful, and whimsical all in one. Pure Silk shaving cream was the next up to try. I've never been one to use shaving cream, instead opting for body soap, shampoo, conditioner, or lotion... Basically just what ever was handy. I have latin (Cuban) blood in my so unfortunately I tend to have to shave my legs rather frequently, especially in the summer. Every other day isn't unheard of for me. The first thing I noticed with the Pure Silk was I got a much closer shave. This was honestly somewhat of a surprise for me because I didn't think it would make that much of a difference. So close in fact that it was 5 days before I had to shave again. A few shaves latter I started with a fresh razor and that familiar dread as they always leave me with little nicks and cuts the first shave or two. Much to my surprise I walked away without even the tiniest cut. I was so surprised by this fact that I spend a full 5 minutes standing in the bathroom in front of the mirror looking at my legs examining them for any tell-tale trickle of blood and just flabbergasted that I couldn't see even one drop. Yay for Pure Silk. It has turned my shaving routine from a torture to just routine. The Tide To Go pen was the object I was least looking forward to testing as I have an allergy to Tide. After much debate and thought I decided it would be safe to try. It is after all just a small amount on a small spot on a single item of clothing. It couldn't possibly cause too bad of an allergic reaction. Of course, I had just spilled coffee on my favorite white tank top that I sleep in. Tide to the rescue. Coffee and mornings.... no I wasn't coherent enough to take pictures. I wish I had. The pen took the stain out in just seconds. When I washed the shirt, I did so with regular laundry and not whites with beach. When it came out of the dryer it was all pretty white with no coffee spots on it. The Tide To Go pen found a new home in my purse. Sadly, I did not use the website offer as I have no wedding to plan. I did look around at their site a little and their offers. This seems like it would be a great thing to do, especially if you are a bride planning a large wedding, or have family and/or bridal party members who do not live close to you. It's just another wonderful way to commemorate your beautiful and special day. Once again, thank you to Influenster, Sally Hansen, Ecotools, Pure Silk, Tide, and Riley & Grey for the items in the Vow Vox Box and allowing me to sample and test them. The VoxBox program is always fun, helpful, and every time I learn both about new products and known products with new product line that I might not have otherwise. Clear Skin and Blue Skies Ahead. It's Summertime! It's summer time. The weather is warmer. The sun is out. And you want to be out in that fresh air enjoying life. Sunshine and the subsequent Vitamin D from sun exposure has its benefits. We need a little bit of those UV rays to prevent things like Rickets and Depression. Not all sun exposure is bad. Moderation is the key to life. But this post isn't about the pros and cons of lazy days out on the beach, in the sand and salt water, soaking up copious amounts of natural Vitamin D in the form of refreshing, warming tropical sunshine...... sorry, got a little sidetracked there with my day dream. Ok, so you want to be out enjoying the summer life. Lazy days on the beach, or lake, or any other outdoor activity. But, if you're like me sunshine puts a nice spotlight on any problem areas on your face. It's embarrassing to admit, but I have always struggled with acne and large pores. I remember being in the 6th grade and begging my mom to let me wear make up so I could try to hide the large dark pores across my nose. And as an adult, I still suffer from this less than flattering condition. Another guilty confession: I am addicted to Pinterest. Last night while waiting out my frequent visitor, insomnia, I was scrolling through Pinterest when I spied something that really caught my attention. A natural skin treatment to help reduce large pores (blackheads) on the nose and smooth skin. I couldn't wait to try it. In my haste I failed to take a picture for before and after results. My apologies. What was this remedy? Something most of us have in our kitchens. Lemon juice and baking soda! then started adding baking soda a little at a time, stirring to make a paste. Don't be alarmed, it will fizz and foam. It is a chemical reaction between the two ingredients and shows that your baking soda hasn't gone stale. Just keep adding a little at a time and stirring until the foaming goes down enough to add some more. The goal is to create a thick, creamy paste. Then using my fingers I smeared the paste all over my nose, cheeks, chin, and center of my forehead (typical T-zone areas). Basically anywhere I suffer most from acne and large pores. I spent a few minutes scrubbing it in (for exfoliation) and then I let it sit on my face for 20 minutes. Like most face masks the paste dries and pulls at your skin. *If you have sensitive skin, 20 minutes might be too long. Start with 5 minutes and work your way up to what you can tolerate. It will burn a little but shouldn't be terribly uncomfortable. After 20 minutes I simply rinsed my face with cool water and patted dry. I could immediately feel the change. My skin felt noticeably smoother. Grabbing a mirror and standing in the sunlight to examine my nose I was happily surprised to see a very noticeable shrinkage in the diameter of the pores across my nose. Not gone, but yes smaller. I let my face breathe for an hour or so and then applied a little bit of coconut oil, which is fantastic for skin care, especially for oily skin. The coconut oil absorbs into your skin completely after about 5 minutes leaving it soft and supple, not greasy. And it has antibacterial properties to help fight against breakouts. I am thinking the lemon juice/baking soda scrub/mask is a bit too harsh to use every day, but perhaps once or twice a week. Also of note, both lemon juice and baking soda have whitening/lightening properties. It may take some time, but over time with continued use these ingredients may lighten skin blemishes and spots. Of course, there are many other uses and benefits, as well as side effects. If you have skin sensitivity test in a small area for a short amount of time first. If you are allergic to either ingredient don't use at all. It probably wouldn't be the best idea to use this skin scrub/mask immediately before heading out into the sunshine either. Be good to your skin. Be kind. Be gentle. Take care of it and it will take care of you. I've also read where people have splashed their face with a mixture of 1 cup water and 1 Tablespoon Apple Cider Vinegar as a toner. ACV is another one of those handy kitchen items that has so many practical uses and is great for the body, skin, and hair. Perhaps I'll cover uses for ACV and other kitchen items another day. In the meantime you can do your own research and tests. Here are a list of some great natural products to keep in the house for use on your skin, in your body, or around the house. I am sure there are many others I am forgetting to list. Know of some or have your own experiences and tips? Leave a comment. I would love to hear your stories. I was excited to try these protein shake samples received in my‪#‎GoVoxBox‬ from Influenster. Having used Whey protein shakes in the past to help manage my weight and blood sugar levels, I am hypoglycemic. I also used them as nutritional supplements for my mother when she was struggling with cancer and unable to eat. There are many benefits to protein supplements and they come in a variety of types and flavors. Even weight loss brand names have gotten in on the hype - Weight Watchers and Adkins. Having used many different brands in the past and tried almost every flavor, I have learned that I am not a fan of most flavors besides chocolate. That being said I started with the flavor I usually like least. Just like our mother's used to tell us when there was something on our plate we didn't like... eat it first. I mixed up half of the vanilla one as was instructed with water, not milk as many other brands of protein supplements suggest. One sip and I had to throw it out. It was bitter and very watery. On to plan number two. Taking the remaining vanilla mix, I mixed in some frozen peaches and a little milk to make it more like a smoothy. Again, I ended up throwing it out after one sip. Having confirmed my absolute dislike for the vanilla I moved on to the chocolate. This time however, I started with skim milk instead of water, and a little ice for thickness. I was sure I would like this one. Just about every other brand of protein shake I've ever tried I liked in the chocolate flavor. However, after the first sip I was ready to toss it. Instead, I let it sit for a few minutes and cleaned my palate with some water just incase I was still tasting remains of the vanilla and/or peach, then tried again. Still no improvement. After trying a few more sips just to be sure I came to the conclusion there was no possible way I could finish the shake. The taste of these shakes was just too horrible. I've used several different brands of Whey protein and diet supplement shakes to include both Weight Watchers and Adkins among others from our local health food store. The‪#‎NextStepShakes‬ have a bitter taste that lingers on the tongue. I could barely swallow the first sip much less an entire 8oz. After completing the taste tests and cleaning up the kitchen I still had this lingering bitter taste in my mouth and coating my tongue and I had to go brush my teeth thoroughly. While I appreciate the samples sent through the ‪#‎Influenster‬ ‪#‎VoxBox‬ program and the cooperation with ‪#‎VitaminShoppe‬ and ‪#‎NextStep‬, this is one product I will not be purchasing. Ok, so it is no secret that I LOVE #Influenster! In the most recent GoVoxBox I received two items from PROFOOT to try, ProFoot Triad Orthotic shoe inserts and the ProFoot Pedi-Rock. They are both wonderful! I have suffered with Plantar Fasciitis since 2012 when I started walking at lunch and after work for exercise. It was frustrating to have to slow and at times even stop my addictive routine. At the suggestion of the pain management doctor I worked for I started using orthotic inserts to help the pain and healing. And it worked! So now I regularly replace the orthotics in my shoes to help control the plantar fasciitis with another trusted brand. So while eager to try a new insert I was also nervous and a bit skeptical, afraid of return PF pain, especially now that I also have developed pretty severe sciatic pain on the right side (oh the joys of growing older!). But thankfully I was in for a very pleasant surprise. I have short wide feet and the inserts still fit nicely in my Nikes and were quite comfortable. The arch support was great for everyday walking, standing, etc... I haven't tried them on the treadmill yet, but considering how well they feel with everyday activities I am hopeful they will hold up well under more strenuous activities. I will be switching out the orthotics in my other shoes (boots) to the Profoot brand. Also tested in this #GoVoxBox from #Influenster was the Profoot pedi-rock. I struggle with severely dry skin and rough heels ever since I was a child. This pedi-rock is by far the best I've ever used, even better than what is used when I get a professional pedicure. I love that it can be used both dry and wet. Taking it out of town with me when I was working in Tampa I first used it on the go for a quick dry buff before rubbing lotion into my feet. Then again I used it most recently at home while soaking my feet in warm water. The pedi-rock is easy to hold with its large contoured shape fitting nicely in your hands. It is firm yet not hard, kind of soft but not squishy so it holds up to vigorous scrubbing. Even when it's wet it holds its shape and dries quickly. It left my feet soft without irritating them. No nasty scratches or "burns". It will be interesting to see how well it holds up over time with repeated use. But this is another item I will be adding to my shopping list. I'm thinking one for the tub for wet use only and another to keep around for a quick dry buff to the heels before lotion and slipping on socks and shoes. Thanks Influenster and ProFoot. #GoPROFOOT !!! Goodbye traveling stress, Hello relaxation! Bath Salts to help me relax after traveling over 400miles to work then busy days in a strange office processing 360 charts. Whew! was already working it's magic. After sinking into the tub full of hot water and bubbles I could feel my whole body relaxing. I can't remember the last time I took a bath instead of a shower, much less relaxed in one. After resting and soaking until my fingers and toes were adequately pruned I found the remaining bubbles easy to rinse off even with the soft water of the Tampa area. I felt calm and relaxed as if most all of the traveling and other stress I'd been carrying around simply washed down the drain with the last of the bubbles. Needless to say, I found myself using the Aqua Spa bath salts every night during my stay and still had a good bit left over to bring home to save for when life gets to be a little too overwhelming. Forget the old saying "Calgon take me away". Aqua Spa Lavender + Chamomile does the trick nicely, gently washing away the stress and leaving a mild, unintrusive relaxing scent. Tamless collection, originally uploaded by ~sierra sugar~. Tameless Hair Collection created by Nita Braken are all of these and more. Each style is expertly executed with a sense of elegance and character. Normally, I have not been one to wear short hair styles, especially not short straight hair styles; however the Tameless collection has won me over. Her styles are fast becoming some of my standard go-to hair when picking out an outfit. The featured styles (listed below) are scripted for 28 color change options, and include streak coloring options, and hat/ribbon color change options. The hairstyles also come in singular colors with streak options if you wish not to have the "Megapack" style that includes all colors. Megapack including all colors are priced at $799L: sale price during first week of release is $399L. Complete Avatars are priced at $499 in shop: sale price during first week of release is $399L. All avatars are listed on the Marketplace at an ongoing reduced price of $399L. The skin is also a new one for me from the store Mojo. The features make the face seem a little more round and softer, which I adore. The lips are pouty but not too puffy, and the overall shading throughout the skin is subtle and feminine. Freckle tattoo and makeup layers are listed below as well. Twisted and Cute, originally uploaded by ~sierra sugar~. Taking a break during the Twisted Hunt at the skybox hunt area of Lemon & Cream. The Fall 2011 Unseelie Twisted Hunt is well under way. The hunt starts at DV8 and includes some 207 stores. It is touted to be THE most difficult hunt to be found anywhere in Second Life all year. However, don't let that claim to fame stop you from participating. It may be a difficult hunt with lots of decoys, prizes being moved, hypnotizing moving textures, and black and blue overload anywhere you go; BUT it is filled with some of the best gifts from all the stores in the hunt. These are top-quality items well worth the time and effort to find them. Also, many of the participating stores have mini hunts within their stores with extra prizes, mazes to complete for more gifts, and gatchas and special gallore! Take your time with this hunt and enjoy. Go with a friend or two, as two pair of eyes are better than one when trying to find the little blurple and black hellraiser boxes. Also, join the Twisted Hunt group ( secondlife:///app/group/73770da7-7d71-a54e-6e86-60a3e9281e07/about ). THEY ARE A FANTASTIC bunch to talk with while you hunt! Keep in mind this is an active and very social group. There is always lots of talk and chatter, and not always on "topic". But that is the point. This is a very social, nutty, and overall friendly bunch of people. They will often help with clues in chat, but will not tell you directly where the box is. Pirate Kitty faded, originally uploaded by ~sierra sugar~. In your message you said, you were goin' to bed, but I'm not done with the night. So I stayed up and read, but your words in my head, got me mixed up so I turned out the light. And I, don't know how, to slow it down. My mind's racing from chasing pirates. Well the man in there swings while the silliest things, floppin around in my brain. And I try not to dream but them possible schemes, swim around, wanna drown me in synch. Oh my mind's racing from chasing pirates. Sierra's Nummbers, originally uploaded by ~sierra sugar~. Completing Strawberry Singh's challenge to list our shape numbers. 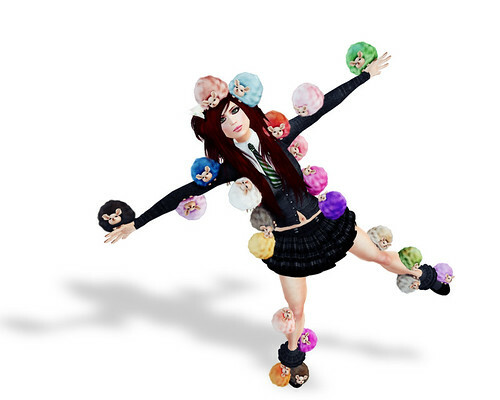 It's wonderful to see such diversity in Second Life and everyone's idea is aesthetics when creating their avatar. Please take a look at her Flickr group "What's your Digits" to see everyone who has participlated. Late nights in Second Life can bring about some interesting results. The other night I was standing on my land in SL AFK and windowed out responding to something on Plurk, not terribly uncommon of me. When I looked back at Second Life there was a strange man standing next to me on my property. Like most of you, coming back to SL and finding a stranger on your land can be somewhat disconcerting. But this was not some nosy, annoying newb, this was a well-put-together male Avatar just standing there quietly next to me, respectful would be the word I would use. Meet Homer Hanly. The photographer and graphic artist behind H2 Photography in Second Life. Homer is a real life photographer and artist practicing and expanding his techniques in SL with the world of 3D Digital Artistry. Now here is where I blush and am ever so grateful. Homer was checking old LMs in his inventory and hopping around SL looking for scenic places to take pictures when he stumbled across my Caribbean Island Oasis and me, oblivious in AFK land. He watched and seemed to like the movements of my AO and the poses it created so decided to take some pictures. What he did with them is just simply amazing. Most of ya'll know I do most of my own photography for eMOTIONS and for fun. But I would (and plan to) hire Homer for a photo session for a personal collection. Check out his blog, Homer's Place and his Flickr! He's got a fun sense of humor and sometimes a daring voyeuristic style I think most of you will enjoy thoroughly. Thank you, Homer for the wonderful pictures and the new found friendship. Thank you for the late night phantom chasing and Photoshop circles of confusion (my confusion creating not yours, lol). Reposting this from a recent Surf Watch entry, check out the full article Here. One little, very little, kitty DJ was spotted doing a unique spin on the decks. Optical Mouse, originally uploaded by snowtigress. I follow a few fashion blogs, ok well more than a few. Anyway, I've noticed a trend lately that has me shaking my head. A few years ago Nitty Gritty made these adorably fun little attachments for nekos. They made cute little house mice, optical (computer) mice, fish, fish skeletons, bird feathers, and a few other kitty themed items that we could appear to have gobbled. They were cute and playful, and most of all fit with what a cat might actually get caught doing. Lately, I've noticed a steady stream of fashion bloggers posting pictures with avatars standing there with food hanging from their mouth. Most of them look as if it has been stuck to their bottom lip with super glue. I've seen pop tarts, lollipops, and even toast. I do get the essence of cute, but do we really walk around with food hanging out of our mouths? And that is more to the point of my post here. Not only have I seen pictures splashed all over the net with various morsels of food prominently featured precariously dangling from otherwise beautiful Avatar's bottom lips, I have actually seen people walking around the grid with these things. Just seems like bad manners. Maybe its just me. We all have our own personal tastes, pun intended. But while I'm pictured playfully here with a mouse that I caught and ran away with (please note I made an effort to hide with my captured treasure in a tree), I wouldn't walk around with it rudely sticking out of my mouth. I'd finish my meal or hide my treat. And I would never be caught with sugary little pop tart stuck to my bottom lip, just as I would assume a non-feline creature would not walk around with a cat-nip filled toy in their mouth. For those of you who find the sweet-filled pastry turned mouth adornments fashionable, photo worthy and posted on the high profile fashion blogs please note this is not a personal affront to you. Just an observation, quirk if you will, and isolated opinion of one little kitty trying to find her own individuality in this great big SL.